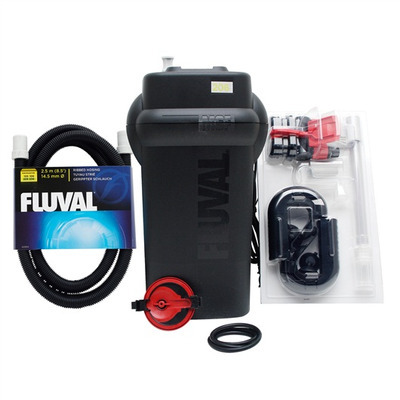 Aquastop system for simple maintenance.� Stops water flow without disconnecting hoses, eliminating leaks and messes. Multi-Stage Filtration.� Mechanical - large capacity foam flters absorb more debris and reduce maintenace frequency.� Chemical and biological - separate baskets allow easy and mess-free media removal. With 3 stage media plus large capacity foam media frame. Quick change mechanical media.� Foam cartridge is readily accessible for fast removal. Instant Prime re-engineered for simple and quick start-ups. Max water column height 1.45m - filter must always be positioned below your aquarium. Use the basic filtration media included or customize filtration in the configuration that is just right for your system. Aquarium filter part for fluval canisters.